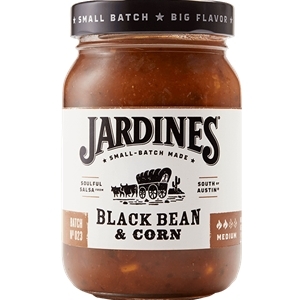 If you're looking for a hearty salsa with an authentic Texas taste, try Jardine's Black Bean & Corn Salsa. It's all natural and filled to the brim with fresh sun-ripened tomatoes, plump black beans and a healthy portion of succulent yellow corn. Black Bean & Corn Salsa is excellent as a dip with chips, as a topping on baked potatoes, nachos or fish, or as the special ingredient in taco soup. Enjoy! 16 oz Formerly known as Jardine's 7J Ranch Black Bean & Corn Salsa. Tomatoes, water, yellow corn, black beans, tomato paste, apple cider vinegar, onions, diced jalapenos (jalapeno peppers, vinegar, salt, acetic acid), diced green chiles, salt, red bell peppers, fresh green onions, dehydrated onions, cilantro, lime concentrate, granulated garlic, ground comino, black pepper, sugar and xanthan gum (natural thickener).